Stuart Gair makes functional vessels intended as much for use as for display. Giving equal weight to considerations of silhouette, curve, weight, balance, volume and proportion, Stuart seeks to produce pieces that command presence in an environment, but which also speak quietly to the viewer. He layers textures and colors using a soda firing process, striving to communicate a sense of quiet and calmness that draws on the hues of natural landscapes. Ultimately, Stuart finds it deeply satisfying to live a life in which there is reciprocal relationship between what he makes and how he observes the world around him. 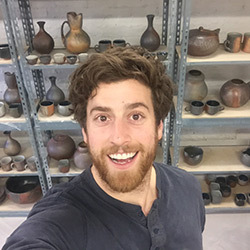 Stuart earned his MFA in ceramics from the University of Nebraska-Lincoln in 2017. He received a BA in history from Ohio University, followed by the completion of a M.Ed program at John Carroll University in Ohio, in 2012, along with two Post-Baccalaureate programs at Ohio University and the University of Nebraska-Lincoln in 2013 and 2014, respectively. He joins the Bray as the 2017 Myhre Scholar. To view more work by Stuart visit his website at stuartgair.com.